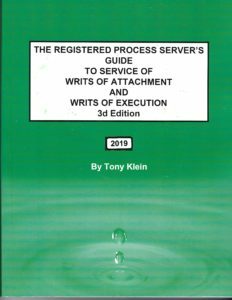 The Registered Process Server’s Guide to Service of Writs of Attachment and Writs of Execution, 3d Edition is updated annually. The current update includes new attachment and levy forms, summarizes the procedures for service at a Central Location that changed the levy process in 2012. It explains the California attachment and levy procedures for registered process servers, judgment creditors and lawyers and provides a step-by-step “cookbook” for properly serving writs of attachment and execution. The book sells for $63.00 ($50.00 + t/s). Each section describes what documents to deliver to the sheriff, what documents to serve on the garnishee (e.g., the bank in a deposit account levy), what to serve on a third party and debtor, and how to serve them properly. The book provides the requirements on how to close the levy file and a checklist for creating and maintaining a process server’s levy file. This book now includes the procedures for each of the 22 Attachments and Levies that may be performed by a registered process server. We have compiled a list all California code sections that relate to the attachment and levy process and provide the text of the sections that describe the attachment and levy of real property, a deposit (bank) account, a real property levy, and wage garnishments. All current Judicial Council attachment and levy forms relating to these attachments, levies and wage garnishments are included for reference or copying. The book includes exemplars of Letters of Instruction to the Sheriff and Registered Process Server, service packet exemplars for service on the bank and judgment debtor, and a packet exemplar for service of a wage garnishment on the judgment debtor’s employer. Exemplars and blank proofs of service for the levies are included for reference or copying. This book DOES NOT cover how to prepare the documents and fill in the information necessary to initiate a levy. We recommend Nolo Press publications or secondary sources, such as The Rutter Group Practice Guides, that cover some instruction about preparation. We suggest that if you bundle that into the services you offer that you familiarize yourself with the laws concerning the “unauthorized practice of law” and “registered legal document assistants”. The Registered Process Server’s Guide to Service of Process in California, 5th Edition covers service of all other types of documents. When purchased with this book, and the Affidavits and Proofs of Service Requirements Guide, you will have the most comprehensive collection of process serving books at your ready reference. All books purchased with the same order qualify as a multiple purchase and are discounted 10%. The RPSG Updates are available in January and are handed out at the PSI What’s New Dinners. The Registered Process Server’s Guide to Service of Process, 5th Edition is available for review and sale at our process serving Events and Seminars. Both books together are $100.00 even, qualifying as a multiple purchase discount. Those of you who purchased the book before 2014 should update the book. There has been a significant change to the attachment and levy law relating to service of bank (deposit account) levies. AS ALWAYS THANK YOU FOR FOR CONTINUED ADVISE AND SUPPORT.